Great economy accommodations with modern amenities. 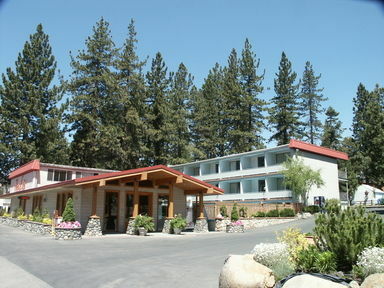 The lodge resides across from the sandy beach and small marina allowing panoramic views and access to Lake Tahoe. Swimming pool is open during the summer months. Outdoor hot spa is open year round. Free continental breakfast includes hot waffles toast sweet rolls fruit and cereal. Beverage choices includes coffee, tea, hot chocolate, milk, and orange juice. Free wireless internet access. Free shuttle bus to famous ski resorts Squaw Valley, Alpine Meadows, Northstar and Homewood.